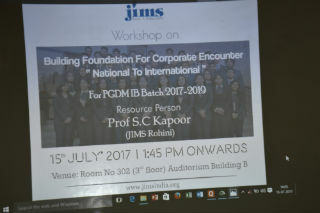 A workshop took place on 15th July 2017 for PGDM-IB students. The topic of the session was "Building foundation for corporate encounter-National to International. 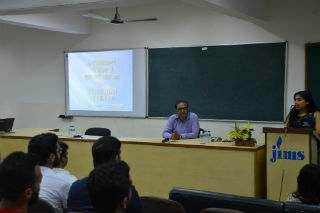 Resource person Prof. S. C. Kapoor shared his vast corporate experience by showing an audio visual named gist of corporate culture. Prof. kapoor also gave a detailed account of the functioning of corporate. 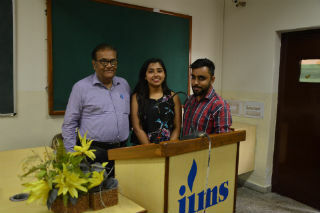 Two Alumni of JIMS also attended the session and they shared their valuable experience of their journey in JIMS and how they could correlate their learning with the corporate world. Prof. Kapoor made the session very interactive and interesting. Apart from inspiring students with his real life experiences, he also taught them management with tales. Besides, he has also given everyone a platform to present themselves. He explained that one should believe in coming out of the comfort zone. Audio visuals shown probed the students to create scenarios beyond the obvious. It was a fun and learns session. The students who performed were rewarded by gifts and candies as a means of positive motivation. 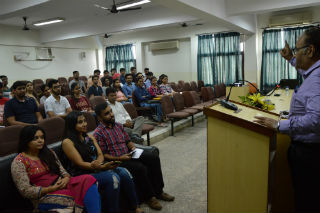 The session was interactive and helped students to enhance their knowledge and skills for competitive business environment. .
Students were very enthusiastic and energetic throughout the session.